Summer vacation means I have time to bake. 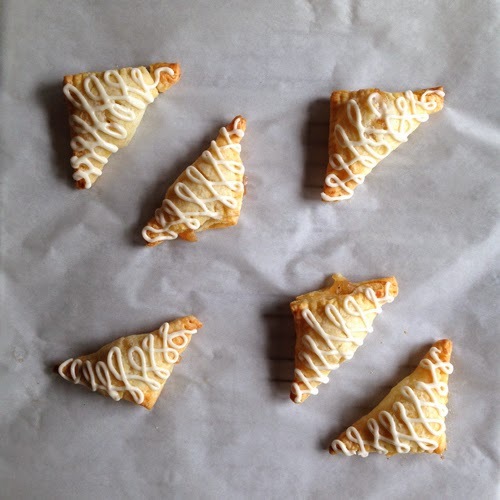 I've been wanting to make some Three-Bite Dutch Letters to have in the freezer for my husband, and I thought it might also be fun to use the leftover apple filling I have from the last time I made Dutch Apple Pie Cookies to make some mini apple turnovers. And this is what I did. It's somewhat uncommon these days that my husband will try something new I've made, and his eyes will widen and he'll say something like, "Wow!" He's so used to my cooking and baking, that it's hard to get a "Wow" any more. These did it, and that makes me happy. I really like these because 1. They involve puff pastry--one of my favorites, 2. They are cute, and 3. You can hold them in your hand without the risk of dribbling the contents all over the place. Plus they taste great. 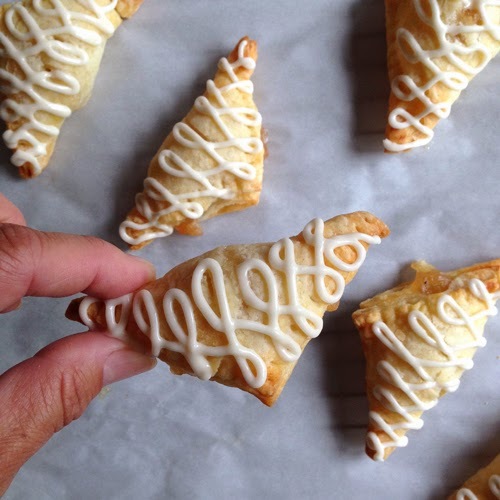 This is just one more yummy thing you can do with the fabulous dough originally meant for Jaarsma's Dutch Letters. What will be next? In a large bowl, stir together the flour and the salt. Cut cold butter into half-inch slices and add to the flour mixture. Toss until butter pieces are coated with flour and separated from each other. Stir egg and ice water together and then pour all at once into the flour/butter mixture. Using a spoon quickly mix until you see no obvious wet spots. Butter will still be in large pieces and "dough" will be in shaggy bits and there will still be lots of flour that's not mixed in yet. Turn the dough out onto a large sheet of parchment paper (or a lightly floured pastry cloth if you have one). Knead the dough ten times or so by pressing and pushing dough together, using the parchment between your hands and the dough, to form a rough square shape. Using a little extra flour for the rolling pin, roll dough into a 15x10 inch rectangle. Fold 2 short sides to meet in the center. Bring the top edge down to meet the bottom edge to form 4 layers. You will now have a long rectangle about 7 1/2 by 5 inches. Repeat rolling and folding process once more. Wrap dough in the parchment paper you're using, and then wrap that in plastic wrap. Chill dough for 20-30 minutes. Repeat rolling and folding process two more times, and then chill the dough another 20 minutes before forming turnovers. Once dough is chilled, and the filling is cooled, preheat oven to 375 degrees Fahrenheit. Line a baking sheet with parchment paper. Cut dough into 4 equal pieces. Refrigerate remaining pieces while you work with one piece at a time. 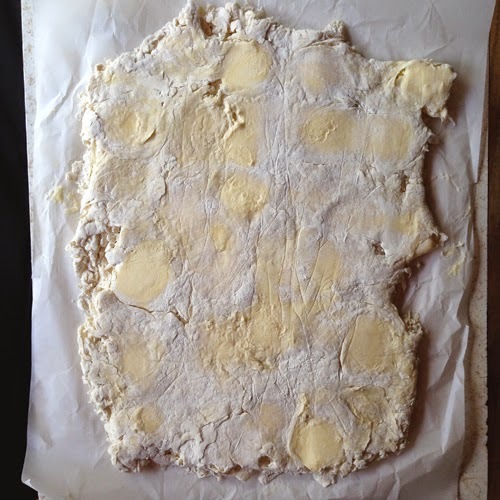 Roll the fourth of dough out into an approximate 13 x13 inch square. Trim the sides with a pizza cutter to "square it up" and made the edges clean. * Cut the large square into sixteen relatively equal sqares. Brush two adjacent sides of each square with the egg white and water mixture. Then scoop about 1 to 1 1/2 teaspoons of apple filling into the middle of each square. Fold the square into a triangle and press edges slightly to create an initial seal. Then take a fork and go around the seams of each triangle and press firmly to seal. Then take a sharp knife and poke 2 vents in the top of each triangle. 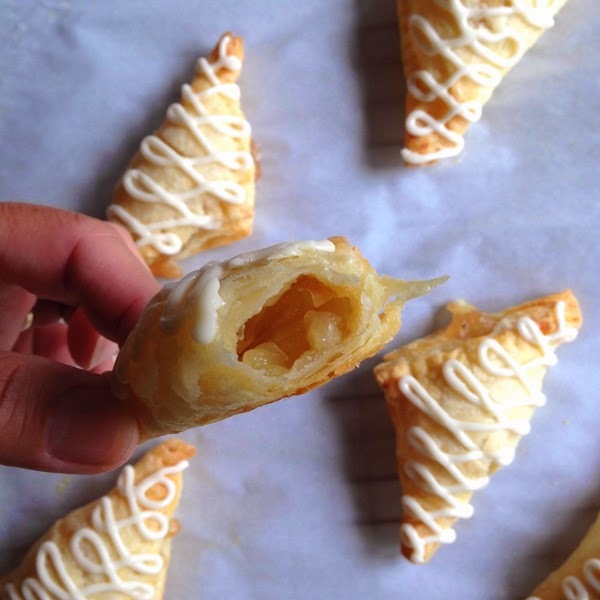 At this point, you can either freeze turnovers on a wax paper lined sheet pan and then transfer to freezer bags so you can bake them up later a few at time, or you can place them on a parchment lined baking sheet, refrigerate for 15-20 minutes, and then bake at 375 degrees for 15-18 minutes. 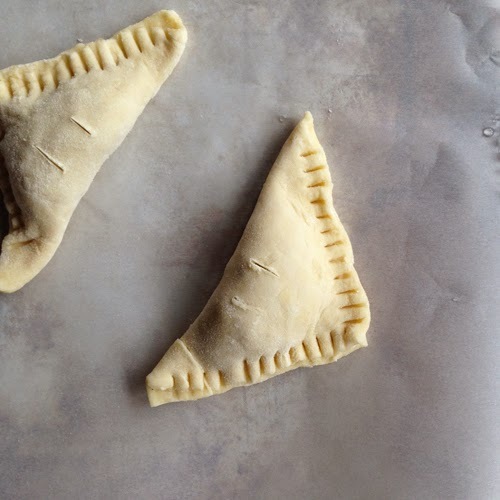 If you're going to bake the frozen turnovers, place as many as you want to bake, about 2 inches apart on a parchment lined baking sheet. Allow them to sit at room temperature while you allow the oven to get to a nice 375 degrees Fahrenheit (I recommend at least a 30 minute preheat). When turnovers are golden brown and puffed, remove from the oven and transfer to a wire rack to cool. 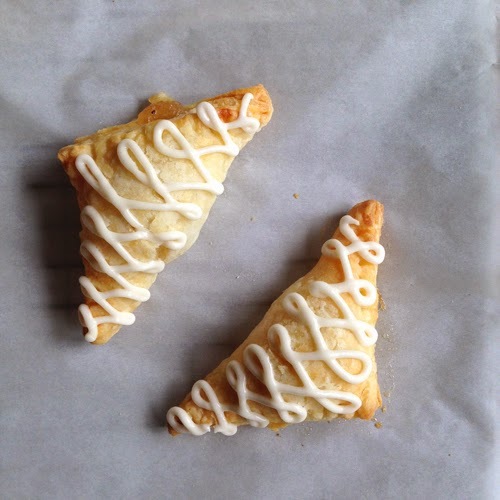 When turnovers have cooled about 10-15 minutes, you can drizzle them lightly with icing, or eat them as-is. *You can bake the scraps up just for fun and snacking...or you can freeze them for the next time you make Chicken Pot Pie Soup and you can eat that with the soup instead of the pie crust. YUM! In a large bowl, toss diced apple with lemon juice and set aside. Pour water (or water + apple juice) into a high-rimmed saute pan over medium heat. Combine sugar, cornstarch, cinnamon, salt, & nutmeg. Add to liquid in pan, stir well, and bring to a boil. Boil for 2 minutes, stirring constantly. Add apples and return to a boil. Reduce heat, cover and simmer until apples are tender, about 10-12 minutes. Stir in raisins. Transfer to a heat-proof bowl and cool completely before using. This is the dough rolled out the first time.